Whether the size of your water garden is a tub on your deck or patio or a large pond, Milmont offers water plants to satisfy all of your needs. 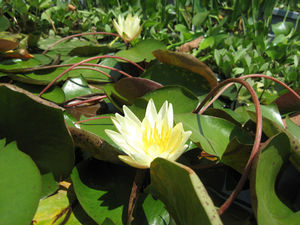 There are a variety of behaviors and preferences of water and pond plants. Some float freely on the surface while others (such as bog plants) thrive in just a few inches of water on the shoreline. Yet others prefer to be potted and totally submerged in the water, either sitting on the bottom of the pond or raised slightly by being placed on bricks or rocks. Another type of water plant is available in bunches so that when bound by a small weight, they sink to the bottom and serve to oxygenate the water or provide spawning habitat for fish. Below is a list of the water and pond plants we offer at Milmont, as well as several helpful articles on water gardening courtesy of the Virginia Cooperative Extension. As always, if you have any questions or want to check the immediate availablility of a particluar plant or product, please don't hesitate to call us at (540) 943-8408. WE HAVE A WIDE VARIETY OF HENRI INDOOR/OUTDOOR FOUNTAINS, WATER FEATURES & STATUARY as well as STONE BENCHES & BIRD BATHS BY STONE AGE CREATIONS!